This page contains a single entry by Ginger published on March 30, 2018 2:22 PM. Just Launched: GaPHA.org was the previous entry in this blog. What is the Best Way to Show Videos on My Website? is the next entry in this blog. If colleges and universitites want to attract top students, it's important to make a good first impression. Before applicants set foot on campus, many will browse a college's website. Does your website portray a modern, professional personality? One that is welcoming and vibrant? 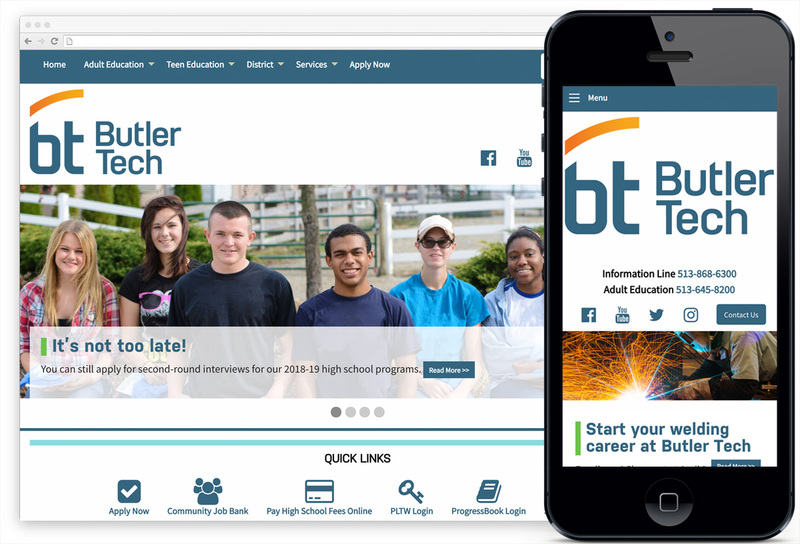 Butler Tech is a career and technical education institute serving adults and high school students in Ohio. Heideldesign recently launched a new website for the college at ButlerTech.org. The new graphics balance bright blues and oranges with clean, white space for an aesthetic that is exciting but not overwhelming. A home page slideshow offers an opportunity to highlight new content, while a quicklinks section connects frequent users to key information like the student portal or online fee payments. The new online calendar can show the site visitor all of the upcoming events at once, or specific event categories can be displayed on key pages to help users hone in on relevant events. A community job bank is a great tool to connect students and employers throughout the area. The new site is powered by the content management system WordPress, which enables marketing staff to quickly and easily update the site, ensuring fresh content is posted in a timely manner. Colleges and universities are important hubs for innovation and creativity, and their websites need to reflect these characteristics. If your college website needs to graduate to the next level, let's talk.